According to statistics from Google, the number of travel-related searches made on mobile devices has gone up nearly 50% in the last year—while searches for "near me" went up 140%. 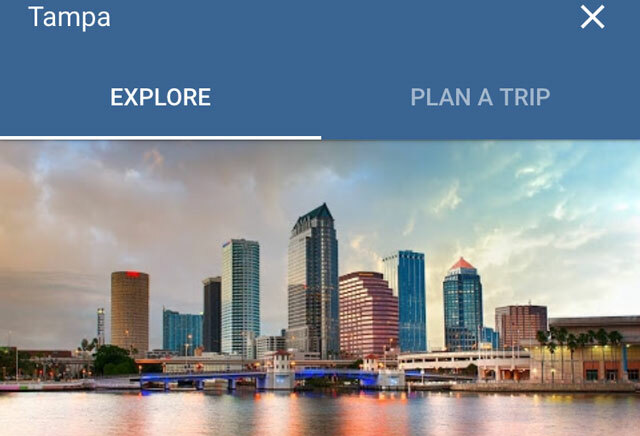 That's a lot of people searching for travel information from their phones, and if you're one of them, you're in luck because Google just launched Destinations. 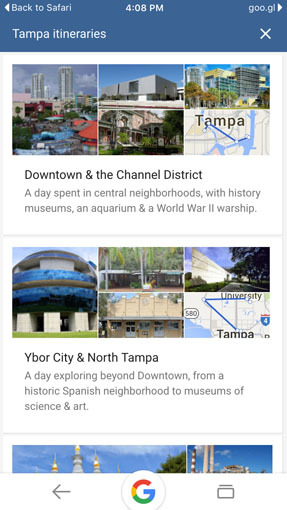 Searching for "Florida destinations" will bring up a list of places in Florida you might want to go, like Key West, Miami Beach, and the Everglades. Searching for "Florida sailing" (or any other activity you might like to do) brings up a list of Florida destinations where you go sailing, like Florida Bay or Pine Island Sound. Click on any of these destinations—or, if you immediately search for a specific destination, like "Key West vacation"—and you're taken to a comprehensive vacation guide. Here, you'll be given lists of the top sites to see, pre-planned itineraries, trip prices, weather information, and when it's most crowded. However, there are some snags here: while you can search for cities, states, or countries, some destinations don't work. For example, searching for "Grand Canyon vacation" only gives ordinary Google search results (though searching for "Arizona destinations" does bring up the Grand Canyon as an option)—instead of searching for specific tourist destinations, you have to pick specific areas. If, after reviewing this information, you decide this is the vacation for you, click on "Plan a Trip." 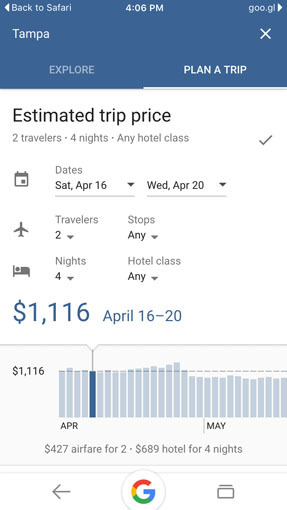 Google will automatically bring up trip prices including both flight and hotel to give you a cost estimate: just pick your trip dates, the number of travelers, and the type of hotel you'd like to get specific pricing for your perfect vacation. Google will bring up a list of flights and hotels to select based on your preferences. And if you're looking for the best bargain, you can scroll through a price graph to see how prices change depending on your travel dates. Investigating a hypothetical 5-night trip for two to Key West, we found a $2,025 deal at the end of May—much better than the $4,000 vacation packages in March—with a flight on Delta and a stay at a 3-star boutique hotel (with Wi-Fi, in case we wanted to plan our next vacation while there). It's a great all-in-one travel search: the ability to easily compare prices for different flights and hotels across different date ranges can't be beat. However, there's still some room for improvement. We'd love it if, instead of having to scroll through date ranges, Google could simply tell us when the best prices were. Another annoyance is with hotels: if you don't like the hotels Google suggests, clicking to see more sends you to a basic hotel list, without prices for your dates—while it offers a lot of options, it also makes us want to hop into the Hotels.com app to see hotel price comparisons. And, finally, if you decide to pick a more expensive hotel or flight, your vacation cost will be higher, but Google doesn't update its price estimate, leaving you to do the math yourself. In the end, this is a better way to search for vacation destinations and get total price estimates than we've seen anywhere else—and combining that with destination information and itineraries makes it an amazing all-in-one travel planning tool. However, it's not an all-inclusive solution for your travel-planning needs. Google is still a search site rather than a travel booking site, and as such it simply passes you on to airline and hotel booking sites to book your trip. What you pick while doing that booking could throw off that initial estimate. But, still, it's a great place to go when you're deciding on destinations, and the initial pricing it offers will give you a good ballpark when you're trying to decide what fits in your budget.